The CCM Opera blog is here for you to keep you up to date on all information pertaining to the Opera Department here at CCM. If you are a CCM Alumni, please take time to subscribe and follow the blog to keep in touch with your fellow alumni. When The Elixir of Love raised its frivolous head on the Post a comment Academy of Vocal Arts season, one had to remember that this organization functions to train singers for the real world, which can mean making something out of very little. Comedian Artie Lange writes about In the up-and-down opera world, singers never know when they’ll end up in a revival of, say, The Pajama Game to make ends meet. But such a low opinion of The Elixir of Love was defied, possibly smashed, from the first moments of AVA’s Saturday opening. In the tiny Warden Theater, where productions are best regarded as sketches of the real thing, here was a handsome set that appeared to have suffered no compromise. Costumes were stylish. Wigs fit! An updated concept placed the opera in Mussolini’s Italy in World War II, giving it new life. The director was Nic Muni, a seasoned innovator who ran the Cincinnati Opera for years and often works with the Canadian Opera Company in Toronto. His contention is that Elixir was intended to have serious underpinnings — composer Gaetano Donizetti called the 1832 opera buffa a melodramma giocoso — and, in any case, gave deeper motivation to the simple plot about a boy seeking a girl with a fake love potion. In this production, when the stereotypical minx Adina appears to be spurning the bumpkin who loves her, she’s actually saving him from execution by a jealous, well-armed Blackshirt. Such touches counted for a lot. The opera went from being casually formulaic to purposely lightweight. The oddest part: AVA’s latest star in the making, mezzo-soprano Margaret Mezzacappa, was very much seen but very seldom heard. The setting was a library, and in a role seemingly created for this production, Mezzacappa was the stern librarian who not only dominated the room but, amid the happy ending, seemed to end up with a guy of her own. This created an implied secondary romantic plot that was obligatory in 1950s Broadway musicals, and for a reason: It takes a bit of weight off leading characters who may be too stereotypical to really carry an entire opera. And what a fascinating opportunity for her to create a character using everything but her primary strength. 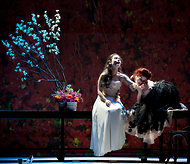 Of course, this opera wouldn’t be done at all were it not a good vocal showcase. And the big discovery, for me, was soprano Sydney Mancasola in the leading role of Adina. She’s a classic soubrette with a voice that’s bright, focused, accurate, and projects an air of effortlessness, partly thanks to the solidity of her vocal technique, partly due to her comfort level onstage. She sashayed around as if she owned the place. And she did. this type of bel canto opera. Much the same could be said for Wes Mason as his rival Belcore and Musa Ngqungwana as Dr. Dulcamara, the elixir salesman, though it’s hard to imagine anybody minding amid such a satisfying overall package. One would be lucky if any future Elixir encounters are this good. A small but chronic problem: The AVA chorus is made up of divas and divos in training, and they don’t exactly stay in the background. Given a chance, they steal focus. Former Cincinnati resident Malcolm Fraser, 72, passed away on May 15th in Stockport, England, of natural causes relating to long term health issues stemming from a hematologic disorder. Mr. Fraser was a prominent figure in the Cincinnati Arts community, primarily relating to his work at the College-Conservatory of Music (CCM) at the University of Cincinnati, where he was the CCM Opera department chair and holder of the J. Ralph Corbett Distinguished Chair in Opera, 1985 to 2003. Under his leadership the CMM Opera department won numerous prestigious awards, including 26 awards from the National Opera Association for the best college opera productions in North America, and he inspired and helped many people in the pursuit of their operatic careers. In 1996 he was a co-founder with Lorenzo Malfatti, a former CCM faculty member, of Opera Theatre of Lucca, CCM’s operatic study abroad program in Lucca, Italy. Singers, instrumentalists, coaches, designers and production staff were overseen by an international faculty in the most comprehensive summer opera program in Italy. Singers who honed their craft during his 18 years at CCM follow Mr. Fraser’s predecessors from the Italo Tajo generation and are working all over North America and Europe. Currently, CCM artists are working in the following companies (in many cases three or four with each company): Metropolitan Opera, Chicago Lyric Opera, San Francisco Opera, Opera Theatre of St. Louis, Santa Fe Opera, Florida Grand Opera, Orlando Opera, Cincinnati Opera, Wolf Trap Opera, Seattle Opera, Skylight Opera, Pittsburgh Opera, Portland Opera, Canadian Opera, Vienna State Opera, Kassel Opera, Stuttgart Opera, Lucerne Opera, Karlsruhe Opera, Dusseldorf Opera and many more. After he retired in 2003, he moved back to England. In 1979, Mr. Fraser was a co-founder of the Buxton Festival, an international celebration of the arts held in Buxton, England. He loved opera and spent his entire career advancing himself in that field and helping to spread his passion to others. He encouraged his students and colleagues to take risks and have fun with the art form that he enjoyed so much. He is survived by his wife of 47 years, Fay Conway-Fraser, his four sons Dom, Sam, Hal and Tim, eight grandchildren, four great-grandchildren, and others. He was a dedicated family man who balanced his enthusiasm for opera with his commitment to and love for his wife, four sons and ever-growing family. He will be missed by his family, friends and colleagues, and will be remembered as a generous and passionate man. His funeral will be held at 11am on Tuesday May 29th at St John the Baptist church in Tideswell, Derbyshire, England. Countertenor John Holiday, baritone José Rubio and mezzo-soprano Caitlin Mathes will all be featured as principle artists on a recording of Philip Glass’s Galilieo Galilei. The recording is a joint endeavor by Portland Opera and Orange Mountain Music. Click here to read more about this new recording. The Mark Wesley Brax, 23, of Columbia, S.C., a University of Cincinnati student killed over the weekend in a two-vehicle crash in southeastern Indiana, was studying voice at UC’s College-Conservatory of Music. He was “a brilliant young man with a beautiful baritone voice,” who spent the summer at the prestigious Tanglewood Festival in the Berkshires before coming to CCM for his master’s degree. Robin Guarino, chair of the opera department at CCM, said the aspiring opera singer was “an exceptional artist and an inspiration to all. Since arriving at the College-Conservatory of Music, Mr. Brax was the baritone soloist in J.S. Bach’s “St. Matthew Passion” in November, participated in the undergraduate production of Handel’s “Serse” and sang with the CCM Chamber Choir and the Vocal Arts Ensemble of Cincinnati. “Talented, focused, and dedicated to his craft, Wesley was a joy to work with in rehearsals and performance,” said Earl Rivers, CCM director of choral studies. He was admired for his “acute intelligence, musical sensibilities far beyond his 23 years, and a truly beautiful lyric baritone voice that was easily produced,” said Kenneth Shaw, associate professor of voice at CCM. “These, combined with a positive, classy personality, made Wes Brax one of the most beloved and respected students we’ve had at CCM in my 13 years on faculty. His vivacity and personal presence lit every room he entered, and gave depth and nuance to his every performance. His recent performance of Elviro in Opera d’arte’s Serse was both a joy and a triumph. His death is a loss beyond comprehension,” he said. This quarter, Mr. Brax was working as the assistant director for the May production of “La Cenerentola” (Cinderella), for which he wrote the supertitles. The opera will be dedicated to his memory. The accident on Saturday afternoon happened near the entrance to Versailles State Park in Ripley County. The student was eastbound on U.S. 50 just east of the park entrance when he lost control in heavy rain and began to skid sideways. His Pontiac Grand Prix skidded into the westbound lane when a westbound Toyota Highlander driven by Donielle R. Stewart, 35, of Cincinnati, struck the Grand Prix. Mr. Brax was pronounced dead at the scene. Stewart suffered compound fractures to her ankles and leg injuries. Indiana State Police believe that Brax lost control in the wet conditions and began to hydroplane, which caused the crash. Bass-Baritone Nathan Stark is currently covering in Billy Budd at the Metropolitan Opera. THANK GOD I was prepared musically, off-book and memorized. I barely had time to take a 5 minute shower, warm up my voice (while in the shower) and jump on the A train to Lincoln Center before I was standing between opera superstars like Nathan Gunn, James Morris and Dwayne Croft singing through Billy Budd – an opera I’d never done before. Everybody from the artists to stage director, the coaches to the conductor congratulated me afterward for being so well prepared in stepping in. They were all so very kind to me and it’s a moment I’ll never forget.